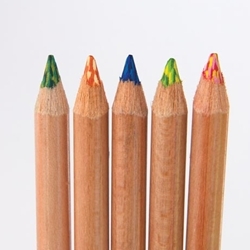 Koh-I-Noor Tritone Colored Pencils - These unique colored pencils contain three colored leads braided together in a 3.8mm lead. The color combinations include analogous colors, shades of the same or similar hue and complimentary colors. The effects they make in a colored pencil are dramatically bold. The line also includes a blender.